The muscles that move and stabilize the jaw are very strong, and one of the more challenging areas in training an actor’s voice. The jaw muscles, made of two major groups, the masseter muscle and the pterigoid muscles, attach to the back of the jaw bone and are used to close the mouth. The muscles used to forcibly open the jaw attach to the underside of the chin, and draw the jaw bone down toward the hyoid bone, which is part of your larynx (or voice box). In this picture you can see the jaw bone on its own. 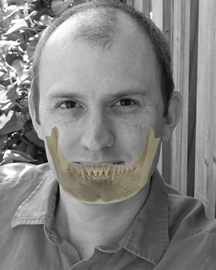 I’ve taken that picture and distorted it somewhat to superimpose it on my face, so you get a sense of where the jaw bone sits, with reference to the face. The following is available for download as an audio file, so you can do the work along with the recording. The first exercise is to let your jaw drop away from your skull. Stand with your head and neck lengthened, and your shoulders wide. This is really important, as neck tension translates directly into jaw tension, so starting with good alignment is essential. Next, let your mouth hang open by dropping your jaw, so that your lower teeth drop away from your upper teeth. It isn’t important to open your mouth very wide here. What’s most important is to let gravity move your jaw rather than using muscles to pull your mouth open. Next take a finger and put it under your chin, and keeping the muscles that move and control the jaw completely relaxed, shut your mouth by lifting your finger. Once your lips touch, release the finger so that the jaw drops open again. Keep thinking that your jaw is very heavy, so you don’t have to pull your mouth open. A heavy jaw just falls open. The second exercise is to begin to shake the jaw very delicately. To do this, you grab hold of your chin with your thumbs below and your index fingers grasping the top surface of your chin. With your spine long and visualizing the top of your head floating up toward the ceiling, gently shake your jaw, focusing primarily on drawing the tip of the chin down and inward; because of the elastic recoil of your jaw hinge, your mouth will swing back closed pretty much of its own accord. Here are two videos, of me Shaking my jaw from the front, and from the side. Note that if you have trouble with this exercise because your teeth “clack” when you do it, that means that you’re doing it too vigorously, and need to focus on swinging the jaw open, and worry less about shutting your mouth. 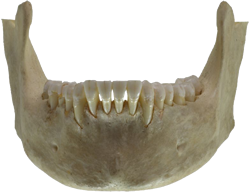 Also beware that some people have issues with their jaw “hinge”, the joint where the jaw meets the skull or temple. The medical term for this issue is Temporo-Mandibular Joint Disorder, aka TMJ Disorder. Tthough many people refer to the condition as TMJ, that’s incorrect because TMJ is a joint rather than a disorder.